The Marvel Cinematic Universe is preparing for the End Game in an excellent new fan-made trailer for Avengers 4. Infinity War has been out on Blu-ray for a week now, allowing fans their best look yet at the epic MCU film, while giving others some more creative fuel. The latest creative work is a fan trailer for the final movie of the MCU's Phase 3, which hits theaters in April of 2019. 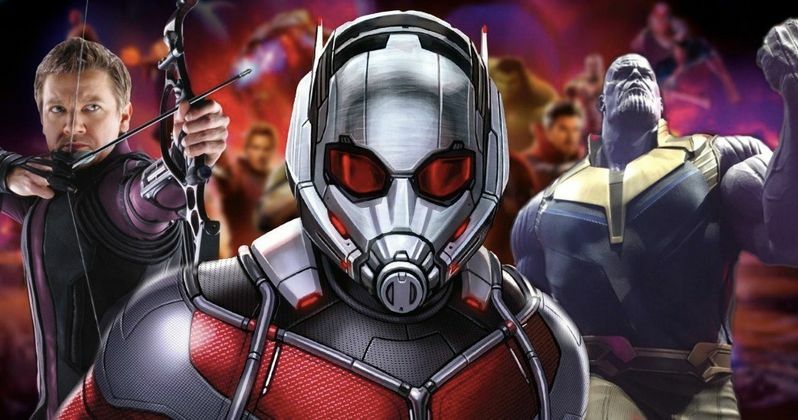 We still don't have the official title announcement from Marvel Studios, but that hasn't stopped a new trailer from getting made that adds Hawkeye and Ant-Man into the mix. Right after Infinity War premiered, questions started to pop up about the official title of Avengers 4. The Russo Brothers and Marvel Studios boss Kevin Feige revealed that there are spoilers contained in the title for Avengers 3, noting that MCU fans would just have to wait. There have been many titles picked up on by fans, but End Game seems to be the one that most are sticking to, mainly because Doctor Stephen Strange utters those words at the conclusion of Infinity War. The new Avengers 4 fan-made trailer takes the End Game title and flashes back through the history of the MCU, with Tony Stark dialogue going back to Iron Man 3. Most of the footage, which is edited together really well, comes from the end of Infinity War after the Mad Titan's fateful snap. From there, we see bits from the past of the MCU, bringing everything together through the death of half of the universe. It's a melancholy trailer, but it has some light when Hawkeye and Ant-Man are brought into the fold. Both Hawkeye and Ant-Man were missing from Infinity War, and it's believed that the characters will play a major role in Avengers 4. Specific details have not been revealed by Marvel Studios, but we have seen both Paul Rudd and Jeremy Renner on the set of the film. Renner appears to be back, but as Ronin this time around, which leads many to believe that Clint Barton ditched the Hawkeye persona after the events of Captain America: Civil War. Renner has not confirmed that Ronin with be in Avengers 4, but he did admit to knowing about the character from the comics and said that he couldn't speak about the matter any further. As for Paul Rudd's Ant-Man, he's currently lost in the Quantum Realm, which will reportedly have a major impact on Avengers 4. It is unclear how everything will tie together, but it has been heavily rumored that the Quantum Realm will bring Captain Marvel into the fold as well, while helping the Avengers go through time to get the Infinity Stones before Thanos. This is all speculation at this point in time, but Ant-Man and the Wasp director Peyton Reed has indicated that the Quantum Realm will play an important role in the future of the MCU. You can watch the fan-made Avengers 4 trailer below, provided by the Smasher YouTube channel.